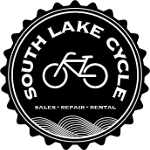 It's winter clearance time at South Lake Cycle! All winter clothing, gear, and accessories 30% off, with discounts on in stock fat bikes too! We had an awesome weekend participating in the Tuscobia Winter Ultra 2017! Mark Schnorr (South Lake Cycle), Paula Carley (South Lake Cycle) and Jon Schnorr finished the 80 mile bike from Park Falls to Rice Lake Wisconsin on the Tuscobia State trail. Paula won 1st female across the finish line for the 80 mile bike 2017! In the photo L to R: At the finish line Jon, Paula, and Mark. Spring is here at your local bike shop! We have new bicycles, apparel, and accessories to get you outside and enjoying that fresh air, whatever your style. We're also offering great deals on last year's models, all winter clothing and accessories, and our in stock fat bikes! Whether you need a Tune-Up, flat tire fix, a new bike, or just want to come by to see the shop, we'll be happy to see you when you stop in! This is just a heads up that we are switching to our Fall / Winter hours as of this weekend (effective September 25th, 2016). Check it out! This is our new, recently redesigned logo. Lake MXZ303 winter riding boots are in! Lake MXZ303 winter riding boots are in, and they are awesome!! We've got a good range of sizes in stock + both regular and wide versions. South Lake Cycle is Exclesior's local bike shop. Your go-to friendly and independent shop for bicycle sales, repairs, and rentals. We have bikes and gear for the young, old, fast, casual, and every type of rider in between. Open year-round. We will be open until 2pm on Christmas Eve. Closed Christmas Day. Back open on Saturday the 26th 10 - 5pm. We had fun riding in the Excelsior Christkindlsmarkt Parade, November 27th 2015. Thank you to good friends of South Lake Cycle for making it a blast! Those kids rocked it. Our rental bikes had a great summer of rides and now we're selling them at a great price! $100 OFF original price. Call or stop by the shop for details.